Ashveyor is a normal –used sender unit in pneumatic ash conveying system. It is mostly used for a few quantities and many delivered places for example hopper of cleaner assembled with conveying bump is a set of conveying system. Controlling pressure and flow rate of feeding and compressed air to make the dust transferred evenly at 3-5M/S speed is operational principle of conveying ash ashveyor. Under this transferred speed, ash and compressed air mixed together evenly. With the function of compressed air, ash flows through transferred pipe. Ashveyor uses Ceramic single disc valves as feeding valves. Working procedures of ashveyor: when material in the hopper reaches lowest level of discharging material, Ceramic single disc valves open. During set feeding time, ash in the hopper will enter overhead tank by the gravity force. 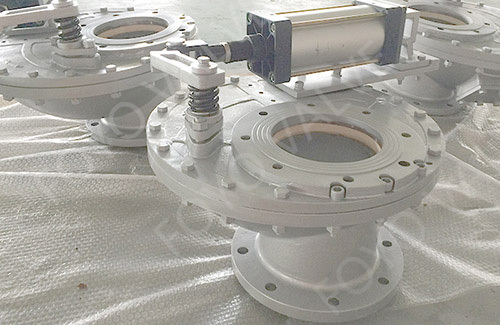 Once set feeding time is over, Ceramic single disc valve will be closed, meanwhile inflatable sealing ring in the Ceramic rotating single disc valves will be compressed by air to make sure of pressure difference between before valve and after valve. Then controllable compressed air system assembled in the first hopper of ashveyor ash conveying system will send compressed air into overhead tank according to set pressure and flow rate. The force created by compressed air will put ash into destination material stock in. During the transportation of ash, air pressure will grow weak gradually. When ash reaches destination stock bin, air pressure almost reaches atmospheric pressure, which pressure will be surveyed by control system. When air pressure reaches the set data, overhead tank stop inputting air and one conveying circle is finished. Once material level reaches the lowest g level of discharging material, next circle begins. Ashveyor is one kind of dense-phase pneumatic conveying equipment’s. Because the ratio of material to air of ashveyor is very high, power consumption is very low, for example typical 200~250m transporting distance, power consumption each ton of material transported is 1.8KW, which is 50% of negative pressure diluted phase pneumatic conveying . Material moves as fluid, which does not need high ash speed. Its average flow speed is 3~5m/s. While diluted phase pneumatic conveying requires that speed of material should be faster than suspension velocity, so pneumatic speed is up to 15~30m/s and material speed is only 0.5~0.9 times of pneumatic speed. The wear rate of pipeline is proportional to power of 2~3 of material speed and 2~3 of V2/V2. For example, if system1 operates at 5 m/s, system2 operates at 12m/s, then for same pipeline wear rate of system 1 is only 7.2%~17.4% of system2. Obviously, ashveyor dense-phase pneumatic conveying has better anti-abrasive performance than diluted-phase pneumatic conveying. Air exhaust is through transporting pipeline, which does need pipeline between exhaust valve and hopper, so there is fewer breakdown and it is easier to control system. Feeding of ashveyor is stuffy closed. Material goes through ceramic single disc valve into pressure tank. Ceramic swing single disc valves cut off static material and then close. All above procedures repeat automatically. 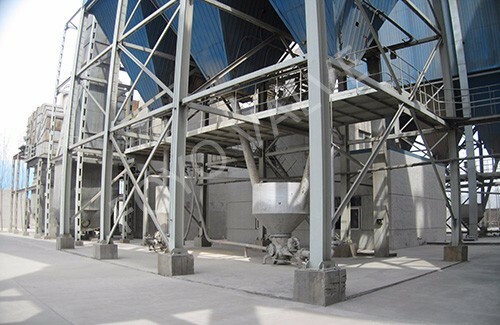 The conveying capacity of equipment should be matched with the max capacity of ash accumulation. When operating, hopper should be empty to avoid that ash will fly away in the airflow. Meanwhile it can help to avoid that ash in the hopper will be wet when there is problem with pipeline. When flow rate is smallest, it is easy and reliable to empty hopper and make sure that ash stops for the shortest time in the hopper to avoid that ash will be compacted when cold.